Kauto Star wrote his name into racing legend by reclaiming the totesport Cheltenham Gold Cup in emphatic style from his stablemate Denman. Kauto Star won his initial totesport Cheltenham Gold Cup two years ago and last year was second to his stablemate Denman in one of the classic confrontations. He was the comeback king today by 13 lengths. 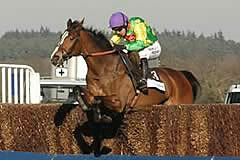 Clive Smith, the owner of winner Kauto Star, said: “I'm absolutely staggered. What a wonderful performance - the best he has ever run. Barry Geraghty and Nicky Henderson were back in the winner's enclosure as Zaynar confirmed form with Walkon in the JCB Triumph Hurdle at Cheltenham. Big Buck's proved the decision to switch him from chasing was the right one when powering up the hill to win the Ladbrokes World Hurdle. Imperial Commander made most of the running under Paddy Brennan to win the Ryanair Chase at the Cheltenham Festival for the Nigel Twiston-Davies team. The red-hot favourite Master Minded won the Queen Mother Champion Chase at Cheltenham for the second year running. Punjabi landed the Smurfit Kappa Champion Hurdle at the Cheltenham Festival in a thrilling three-way finish. Champion trainer Paul Nicholls saddled the first three in last year's totesport Cheltenham Gold Cup, with Denman beating Kauto Star and Neptune Collonges, and the same three horses dominate the betting for this year's renewal of Britain's top chase which is worth a record £475,000 and staged at 3.20pm on Friday, March 13. A horse whose career has been a book of battles against injury, proved the good ones can come back when second in the Seasons Holidays Queen Mother Champion Chase. Dunguib was in top form on his long-awaited return to the track when winning the Weatherbys Champion Bumper at Cheltenham. Silk Affair finished brilliantly under Tom O'Brien to outbattle her Fred Winter Juvenile Handicap Hurdle rivals. Ninetieth Minute gave Ireland its seventh winner of the Cheltenham Festival as he powered clear in the hands of Paddy Flood to win the Coral Cup. Cooldine galloped his rivals into the ground when running out a wide-margin winner of the RSA Chase at the Cheltenham Festival. Mikael D'Haguenet stayed on strongly in the hands of Ruby Walsh to take top honours in the Ballymore Novices' Hurdle at the Cheltenham Festival. Sam Waley-Cohen guided Tricky Trickster to victory in the marathon four-mile National Hunt Chase Challenge Cup at Cheltenham. Tony McCoy was seen at his very best as he dragged Wichita Lineman home in the William Hill Trophy at the Cheltenham Festival. The Noel Meade-trained Go Native brought success for Ireland in the opening williamhill.com Supreme Novices’ Hurdle under a powerful ride from Paul Carberry, who held off a late challenge from Medermit by a neck. Birthday boy JP McManus enjoyed a unique moment at Cheltenham today when horses he owns filled the first three places in a Festival race. Willie Mullins and Ruby Walsh got off the mark at the Cheltenham Festival when Quevega ran out a seriously impressive winner of the David Nicholson Mares' Hurdle. Kasbah Bliss, who only found the mighty Inglis Drever a length too good in last year’s Ladbrokes World Hurdle, heads the 16 acceptors at the six-day confirmation stage for this year’s renewal of the £260,000 contest the feature race on day three of The Festival, Thursday, March 12, 2009. The anticipation for this year’s Festival keeps building as six-day confirmations were revealed today for the second day, Wednesday, March 11. The final piece of the jigsaw ahead of The Festival 2009 falls into place today with the unveiling of the 43 entries for the Christie’s Foxhunter Chase. The contest, run over the Gold Cup trip of an extended three and a quarter miles, takes place on the final day of The Festival, Friday, March 13. You might tell your better half that Christmas or your anniversary or some other family occasion is your favourite time of year. We know the truth though and after a year of racing it’s the only festival we love to celebrate the Cheltenham Festival and it’s just over a week away. Entries are revealed today for the Weatherbys Champion Bumper and the David Nicholson Mares’ Hurdle, both of which promise to be cracking contests. Ante-post betting interest for The Festival intensifies today with the publication of the weights for the 11 handicaps, details of which were revealed at the Cheltenham Countdown 2009, held today (Wednesday, February 25) at Cheltenham Racecourse. Cheltenham today announced that it is to honour legendary Festival bookmaker Freddie Williams, who passed away last year, by naming a race after him at this year’s Festival. The first running of the Martin Pipe Conditional Jockeys’ Handicap Hurdle has drawn an amazing 216 initial entries. The new contest – staged over and extended two and a half miles – will be the penultimate race of The 2009 Festival on Friday, March 13, and has attracted huge interest. The Festival is set for some fascinating novice events in 2009 following the first scratchings deadline, details of which are revealed today. Cheltenham announced today that it has been granted permission by the British Horseracing Authority to delay the closing date of the Christie’s Foxhunter Steeple Chase at The Festival by a week. Leading bookmakers William Hill were today unveiled as the new sponsors of the williamhill.com Supreme Novices’ Hurdle – the famous curtain raiser at The Festival on Tuesday, March 10. The picture for the five championship Grade One events at The Festival becomes a little clearer today with the publication of the latest acceptors following the first scratchings deadline. Few things are more coveted by trainers than a victory at The Festival at Cheltenham and no current handler has enjoyed more success than Nicky Henderson, who can boast 31 winners at jump racing’s premier event and holds a strong hand this year, spearheaded by current Smurfit Kappa Champion Hurdle favourite Binocular. Champion jockey Tony McCoy, with 20 wins to date, is the most successful current rider at The Festival. Coral announced today that it will quote prices on request for any horse for any of the 26 races to be staged at this year's Cheltenham Festival. Entries are revealed today for the four Grade One novice hurdles at The Festival – the Supreme Novices’ Hurdle (Tuesday, March 10), the Ballymore Properties Novices’ Hurdle (Wednesday, March 11), the JCB Triumph Hurdle (Friday, March 13) and the Albert Bartlett Novices’ Hurdle (Friday, March 13). Coral has introduced Ainama into their Supreme Novices' betting at 14-1, following his winning debut over hurdles at Kempton today. Bumper entries are revealed today for The Festival’s three novice chases – the Grade One pair of the RSA Chase and The Irish Independent Arkle Chase – and the four-mile National Hunt Chase Challenge Cup, which will be run for the 139th time this year. Paddy Power is paying out on Master Minded to win the Seasons Holidays Queen Mother Champion Chase at the Cheltenham Festival. The bookmaker will pay out now on any ante-post singles placed on Paul Nicholls' brilliant chaser almost two months before he even goes to post in the championship contest. Cheltenham Racecourse today announced that the newest race at The Festival is to be named in honour of Martin Pipe, the most successful Jump trainer of all time. Having created history with a third victory in the race last year, Inglis Drever is among a top-quality entry of 36 for this year’s Ladbrokes World Hurdle, highlight of the third day of The Festival on Thursday, March 12. Last year’s winner Katchit has failed to fire on his three starts so far this season but has often reserved his best for Cheltenham in the past. Following his devastating victory in last year’s race, Master Minded heads a top quality entry of 29 for the £320,000 Grade One Seasons Holidays Queen Mother Champion Chase, highlight of day two of The Festival, Wednesday, March 11. Upgraded to Grade One status for the first time last year, the £220,000 Ryanair Chase has already firmly established itself as one of the premier races in the calendar and the two mile, five furlong, contest, run on Thursday, March 12, has this year attracted a superb entry of 48. Cheltenham Racecourse today announced that the most famous race in the calendar for staying novice chasers will have a different title when it is next run on Wednesday March 11, 2009. Cheltenham today revealed that The Sun newspaper is to sponsor the Best Mate enclosure for the 2008/09 Season. Cheltenham Racecourse today announced that an additional marker will be placed on its Cross Country Course to ensure that there is no confusion among racegoers and television viewers as to whether a horse has taken the correct route around the course. Shinrock Paddy, a four-year-old son of Deploy, became Cashmans’ favourite for the Weatherbys Champion Bumper at the Cheltenham Festival after scoring easily in the closing race at The Open. 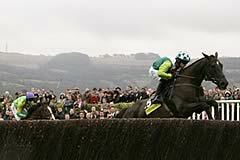 The 2008 totesport Cheltenham Gold Cup was a glorious race that matched or even exceeded the pre-race the hype. With the best-laid plans of Denman’s owners Harry Findlay and Paul Barber, plus a little help from the weather, coming to spectacular fruition.